Usually ships in 40 to 43 days (ships from US) Estimated lead times do not include weekends or holidays. Transit time is determined by shipping method and destination. Orders requiring credit information might take additional time. Smoking Shelter Dome Roof Three Sided With Open Front 10' X 2'8"
Smoking Shelter Dome Roof Three Sided With Open Front 7'6" X 2'8"
Smokers shelters provide a designated smoking area outdoors while protecting smokers from extreme weather conditions. 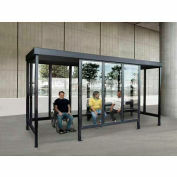 These outdoor shelters can also be used as convenient bus stops providing an extruded aluminum bench and backrest along the rear wall to offer a comfortable sitting area for everyone. Smoking shelter huts help reduce OSHA fines and reduce insurance premiums. 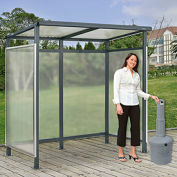 The framing system of these smoking shelters is built with industrial grade standards to withstand years of outdoor use. 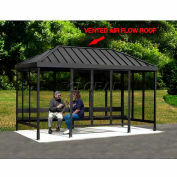 Smoker shelters are made with dark bronze anodized aluminum finish. Dome roof is made with 1/4 thick white translucent acrylic that is break resistant. 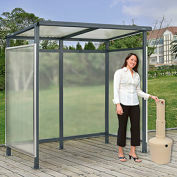 Glass panels are made with clear 1/4 thick tempered safety glass. 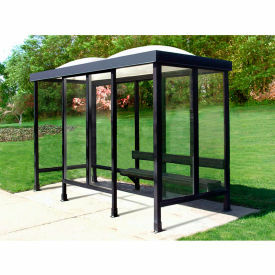 Outdoor bus stop shelters are pre-fabricated in sections for easy assembly and crated for low cost shipping. ADA compatible.